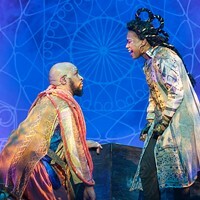 Homespun Tales | Theater | Style Weekly - Richmond, VA local news, arts, and events. 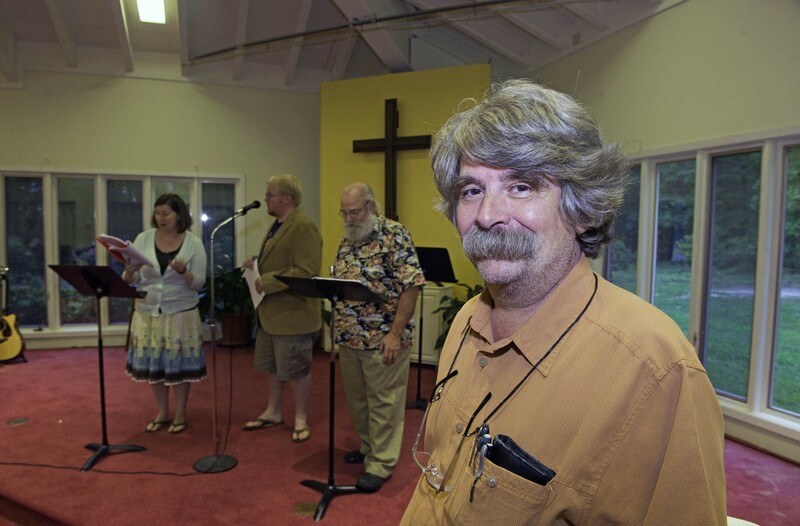 Three-Penny Theatre company finds its own Lake Wobegon in Richmond. 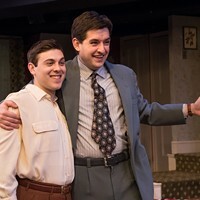 Ray Carver hopes to replicate the down-home charm of the nationally revered “A Prairie Home Companion” with Three-Penny Theatre company’s own version. “The Rivah Home Companion” will feature sketches playing off local history. For fans of Garrison Keillor's sonorous voice and his news from Lake Wobegon, Ray Carver has a treat better than a slice of bebopareebop rhubarb pie. Taking a page from "A Prairie Home Companion," Carver and his Three-Penny Theatre company have crafted "The Rivah Home Companion," bringing the homespun radio show's charm to Richmond. Though it won't be broadcast over the airwaves, the performance will have the setup of a live radio show. 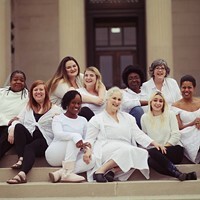 Founded by Carver, the Gayton Kirk Presbyterian Church and some of Carver's former high school drama students from Caroline County and Gayton Kirk, Three-Penny performs original pieces that relate to Richmond. 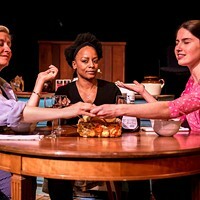 With "Nothing to Fear," Three-Penny explored the Great Depression and what it meant for minorities under Virginia's Byrd machine. In "Mark Twain's Civil War," the company looked back at the iconic humorist's brief time at war. And Carver narrates "A True Story," in which Twain's servant describes having her husband and children auctioned as slaves in Richmond. 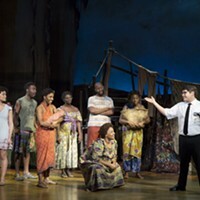 "With all of these plays we try to have some sort of Richmond connection so that it speaks to this place," says Carver, director of the company. In "Rivah," Three-Penny will take on decidedly lighter fare, "presented live on stage as a radio show without a single reference to Norwegian bachelor farmers," according to the marketing. One of Carver's favorite sketches features a teenage Edgar Allan Poe. "He was quite amorous here in Richmond," Carver says. "The episode we play in the show is called Elmira. Poe gets taken home by Elmira to meet the parents, and, needless to say, it doesn't go well." The sketch is also a favorite of cast member Andrew Isola. "He's a drunk, he's terribly behaved, and all he ever talks about is death," Isola says. "The gentleman playing Edgar Allan Poe is amazing. There aren't any recordings of what Poe spoke like, but if I had to guess what he acted like, this guy is spot on." Another segment makes fun of how the region treats every snow flurry as though it was a blizzard. "The sketch is sort of based on me being from the North, coming down to Richmond and seeing how people react to the weather," Isola says. "We're hoping that the play will be a little bit of a nod to 'Prairie Home Companion,' but still have a Richmond flair." In another hat tip to "Prairie," the show will present Miss Blanc, a spin on the radio show's detective Guy Noir. "She's kind of this femme fatale who goes around solving mysteries in Richmond," says performer and co-writer Derek Gayle. "It's presented as a radio drama with a comedic slant to it. There's a lot of parody and wordplay in it, and that's a big part of our second act." Addition, the performers will relate things like a dating service for Civil War re-enactors, a Richmond sweet tea party during the American Revolution and a Southern cooking segment with a lot of butter. And as with all Three-Penny shows, admission is pay-what-you-will. "We're doing this for the people who are theater goers, but also for people who don't normally go," Carver says. "We're all about getting new people interested, and getting people to realize that you can set plays in Richmond." "The Rivah Home Companion" plays on Aug. 15 and 16 at the Gayton Kirk Presbyterian Church, 11421 Gayton Road. For information, call 741-5254 or visit 3pennyplays.org.